What a very interesting idea indeed, for a woman to run a womenswear house. A large swathe of the major fashion brands are run by men, from Gucci (Alessandro Michele) to Givenchy (Riccardo Tisci) to Chanel (Karl Lagerfeld) to Yves Saint Laurent (Anthony Vaccarello) to Burberry (Christopher Bailey); last year Vanessa Friedman at the New York Times noted, in a piece praising collections from Stella McCartney and Alexander McQueen’s Sarah Burton, that less than 20% of the brands showing in Paris had woman creative directors. 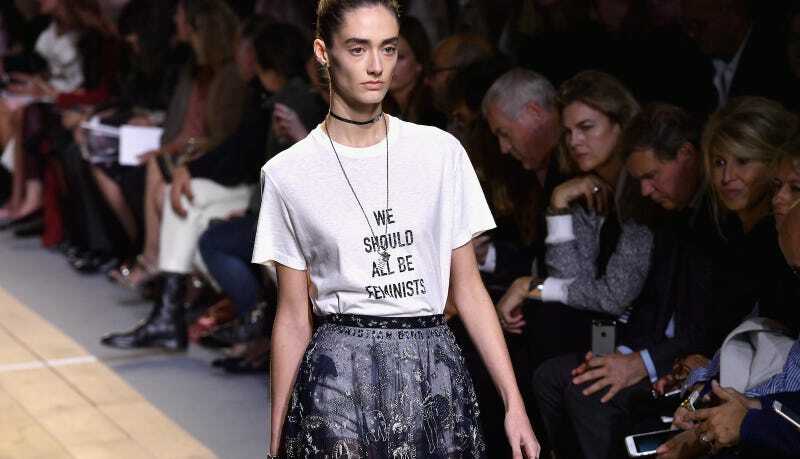 Chiuri’s collection for Dior was clearly a feminist one—there was literally a t-shirt that read “We Should All Be Feminists.” “Feminism is a recurring word for her,” the show notes said of the designer. Beyoncé’s “Flawless” played on the soundtrack, and Chimamanda Ngozi Adichie was in the crowd; rather than being stuffed into torturous platforms, the models wore flat sneakers. But the collection seemed to be keenly focused on another theme, as well—its own bottom line, which is where things sort of fell apart for me. Although I was dying for these designs to be great, they weren’t. “It’s a schizophrenic moment, and that just can’t be good,” she said, citing clothes seemingly meant to exist on Snapchat alone. While Chiuri’s s/s 2017 collection was too low-key to be accused of traffic-stopping goals, it was excessively branded and extremely on-the-nose; models were put in black chokers and straightjacket-inspired streetwear, followed by gauzy, diaphanous looks and Instagram-friendly t-shirts, symbolizing a kind of feminist release. There were some lovely dresses, some of which, I’m sure, we’ll see on the red carpet—but nothing about this collection felt remotely free. The classic, painstakingly constructed Dior silhouette was mostly lost, although if there were interesting ideas to replace it, that wouldn’t necessarily be so painful. Instead, “Dior” was written into straps and waistbands and in gigantic gold letters on bags, strongly reminiscent of those Calvin Klein undies that are doing so well right now. Chiuri is clearly deeply skilled and knowledgeable, an incredible designer, as we’ve seen from her years at Valentino. Her new boss considers her to have “no fear.” But is fearlessness an easily summonable quality for a woman newly helming one of the major brands of a male-dominated industry? In other words, her rarity as a woman in the profession of helming a prestige womanswear brand likely invites added pressure, the least of which must be the ability to sell. Whatever the origins, the whole thing felt deeply constrained, the play on straightjackets doing little to alleviate this. And it’s hard not to imagine that a certain “schizophrenia” is to blame—the need to feed a market hungry for clever rich kid accessories, made to be photographed rather than loved. Correction: a previous version of this post said that Hedi Slimane is the creative director of Saint Laurent; Slimane left earlier this year, replaced by Anthony Vaccarello. UPDATE: The garments I initially took to be straightjacket-inspired were actually, according to show notes later reported by The Guardian, based on “the uniform of the female fencer [which] is, with the exception of some special protections, the same as for a male fencer.” I think I like this reference even less!